The end of World War II saw the removal of a stigma around social housing with the rebuilding of much of the housing that was destroyed during the conflict. 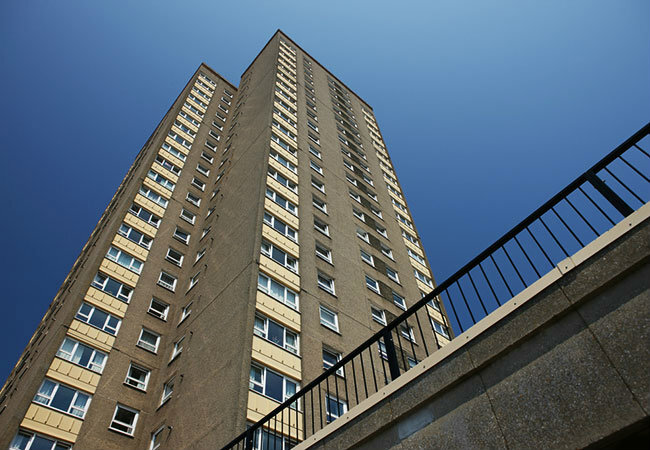 Eventually, the main role of social housing became the replacement of housing stock through clearances, and mass building, the result of which was the decision to mass build high-rise housing across the UK. Between 1955-1975, around 440,000 flats were constructed, the majority of which were built in urban districts with tenants relocating from slum-clearance areas. The idea of the ‘Streets in the Sky’ was initially met with excitement and a vision of futuristic architecture. However, by 1970 the dreary high-rise buildings spread across the country had been found to be far lower quality than expected, and the concept of these council high rise flats was criticised for creating badly built, high-density housing. It became clear that a number of the key social housing projects had serious faults that were dangerous and expensive to repair, arising from poor design and poor quality resources and materials that caused huge problems for the families living in them. Particular faults that were pointed out included concrete of a poor standard, thin walls, chemicals which eroded the steel and materials which weren’t suitable for withstanding the British climate. For this reason, it is no wonder that the people of Britain became disillusioned by the mass housing that has been constructed, and the Government weren’t particularly pleased with the outcome either. Completions of mass housing fell rapidly, continuing into the early 1970s with rising inflation and interest rates putting pressure on Government to increase spend on housing. The 1956 Housing Subsidies Act encouraged councils to raise their rents to a realistic level, while providing rent rebates for some of the poorer households. This meant less subsidies for richer households, and therefore encouraged them to move out of social housing and purchase a home if they were capable of doing so. Eventually this became compulsory in the 1970s, generating a huge migration of people moving from social housing to private tenancy or home ownership. The 1970s also saw councils building far less housing, instead placing their resources into the repair and maintenance of aging housing stock. Pressure was eventually placed on placing social housing for sale, which saw the number of council houses sold in England increase from 7,000 in 1970 to 46,000 in 1972. This led to the introduction of ‘Right to Buy’ which became prevalent in the Thatcher Era and remains a heated discussion point to this day. It was also in this particular era that Ben Downie, our Director and Conservation Architect, was involved in a Civic Trust award winning team. At Inkpen Downie we are dedicated to activating change in architecture, design and space, which is why we work closely together to help realise our clients aspirations.